← First Monthly Blog Sponsor Giveaway! 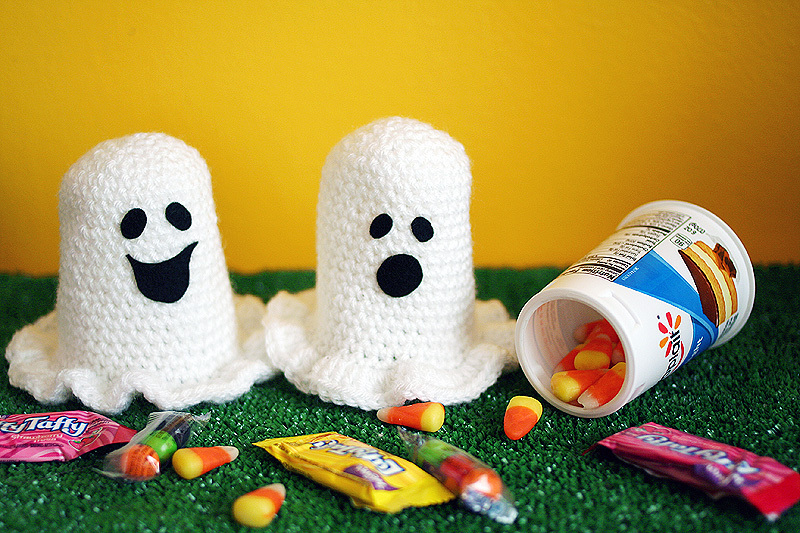 Free Crochet Pattern: How to turn a Yoplait cup into a cute, ghoulish ghost candy container! I tried Yoplait’s “Boston Cream Pie” yogurt over the weekend…and it was unfortunately not a favorite. Too sweet for me, although I do love the idea of eating pie for breakfast! While rinsing out the yogurt cup, I took a few seconds to stop and think of a fun crochet project to save this cup from the recycling bin and give it an extra life in my house. In the spirit of the season, I whipped up a little ghost sweater for it! I think it could be a fun way to decorate a small table and store tiny trinkets or even candy corn or M&M’s! We took a ghost cozy to the pumpkin patch to make our little video, and a little girl ran up to it with extreme delight. I think this is a good sign. Right Side of work should show on the outside of your project. With White, make magic circle, or ch 3 and sl st t0 1st ch to form ring. Rnd 1: Ch 1, work 6 into ring. (6) Don’t join rnds. Cut a face out of black felt and glue on. Stick candy in yogurt cup, and surprise someone! 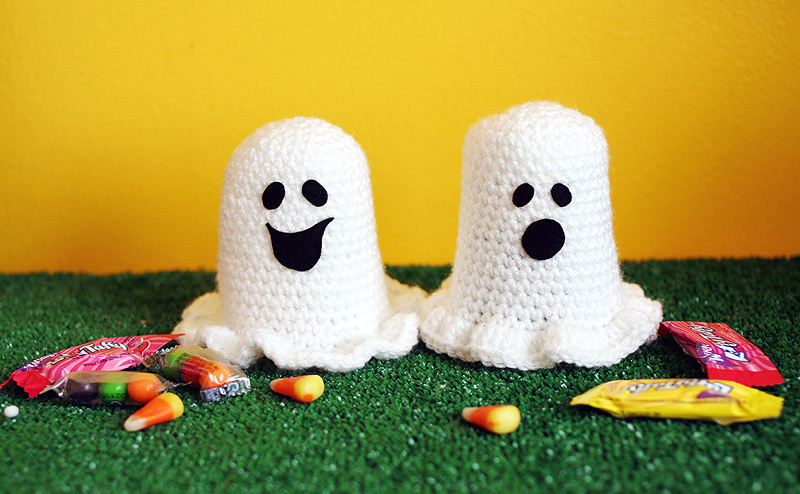 12 Responses to Free Crochet Pattern: How to turn a Yoplait cup into a cute, ghoulish ghost candy container! So cute! I wish I could crochet. Though I taught myself to knit this weekend, so crochet will come next! I need to sharpen up my knitting skills! I’m so slow at it! Thank you for the ghoulish ghost candy container pattern, perfect to make for this season, I love these ghosts. Loooove it! I’m going to make it right now actually! Btw, when are you going to have lessons in Los Angeles? It would be fun to have a meetup with other crocheters with food and crochet nothing other than, FOOD! Soon please! Darling video! I think I know where you were….hmmmm…Webb Ranch? Such a fun place! Love those ghosts! Yep, that’s totally where we were! This is great! I’m looking to crochet a spooky gift for my partner. I’m sure they’ll love this little ghostie. Thank you!